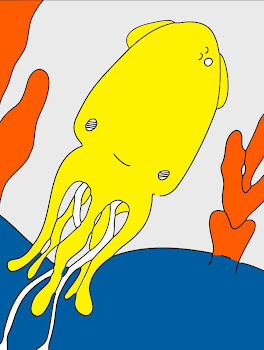 Technicolor Squid: One Day Closer To Thirty. One Day Closer To Thirty. I am not really sure that I want to mention today's significance, but all the same I guess I have. I have not ever really feared my birthday. This year is different. We had a wonderful time at Bumbershoot, surrounded by cute and quirky young twenty-somethings. Now, I realize that I like being in my twenties. I am not sure that I am ready for my thirties. It does not seem old at all (quite the opposite) it just feels different and that is scary. So I guess now that I am in the last year of my twenties (29) I should really enjoy it. Maybe I can try to figure out exactly what the idea of my twenties mean to me and what I am afraid to lose in my thirties. And then, I should really try to enjoy it while I can. In other news, my mom picked out this picture from my sketchbook and picked the all colors to add. I thought she did a good job and so I decided I would share this with you. I have more to tell you about/show you from Bumbershoot. Today we gooco'd and I will have pictures from that to share also. In the meantime I am thinking of you all. I can not wait to catch up with you next week. Hugs to you! xox=vv. HAPPY BIRTHDAY!!! I wish all the joy you deserve!!! And I think your mom did an excellent job with the color selection!!! Happy Birthday to you! I hope you have a FANTABULOUS day, and all yer birthday wishes come true! well happy birthday dear girl! just tons of well wishes and good thoughts for your special day!! wish i could come bring you a cupcake! Happy Birthday! 30 is a great year! I felt older and wiser and knew myself better than ever before! I also had a new baby and therefore a whole new job to learn! Enjoy it to the max!!!!! I'm always late with birthdays but Iwish a Happy happy birthday!! your birthdays in september too! :) yay! happy hippity birthday. Happy, Happy Birthday! There you are! For some reason, I could not get on your site for the longest time. It is looking fabulous. Embrace who you are and not your age is what I say...I'll be turning 29 in October and am excited... Every year is a new adventure. Happy belated b-day!! I agree with the rest - my 30's have been the best and yours will too! So glad you made it to Bumbershoot, I haven't been in a few years...:( Best show I ever saw was the Magnetic Fields at the Opera House! Happy birthday, I hope you'll have a great great day! Happy belated birthday Christine! and believe me, the thirties are the absolute best! Happy belated wishes to you !